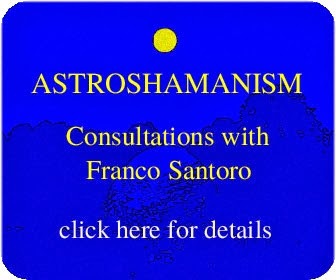 “By the fact that the shell of his drum is derived from the actual wood of the Cosmic Tree, the shaman, through his drumming, is magically projected into the vicinity of the Tree; he is projected to the <Centre of the World>, and thus can ascend to the sky”. Mircea Eliade, Shamanism:Archaic Techniques of Ecstasy, Princeton, pp. 168-169. The drum represents the most ancient form of human musical expression and is one of the major tools used by shamans and healers of all cultures. Whereas the rattle is generally associated with the high-frequency energy of the Sky or Higher World, the drum is usually related to the low-frequency energy of the Earth, or Lower World. It is believed that the drum draws in Earth energies and the rattle attracts Sky, or Higher energies. Drum beats are reminiscent of those of our heart and the inner core of this planet. The drum also creates the acoustic environment of our prenatal stage and the first sound we heard: the beat of our mother’s heart. As it is often the most important instrument of a shaman, the drum is regarded with extreme respect. It is frequently identified as a means of transportation (a horse, deer, for instance) that allows the passage along the vertical axis, or Great Tree, and the connection between Sky and Earth. According to shamanic cosmology there are three basic areas, the Three Worlds (Higher, Middle and Lower Worlds) linked together by a vertical axis, which is commonly referred to as the Tree of the World, or Great Tree. In astroshamanism this represents the umbilical cord of the illusive universe born out of the separation. The purpose is to move back through this channel and release the different stages of the separation so as to finally return to the full awareness of unity. It is the journey to the original land or home. Through the sound of the drum, the shaman moves up and down the Great Tree, communicating with the various worlds, connecting the fragmented parts of the puzzle, restoring the reality of unity and undoing all that has been manifested since separation started. The drum constitutes a microcosm of the multi-dimensional universe whose entire cosmology is represented in the drum itself. In a two-headed drum, one side may produce a higher, positive, yang tone that is connected to the Higher World, whereas the opposite side sends out a deeper, negative, yin tone related to the Lower World. The rim of the drum can be related to the horizontal axis, the Middle World, the surface of the Earth and the trunk of the Great Tree. It operates as the linking agent between the higher and lower realms, restoring the balance of polarities and annihilating their illusive separation. The Higher World side of the drum facilitates the capacity of vision and the opening of the higher centres, or the higher chakras, whereas the Lower World side tends to develop primal energy in the lower charkas. This energy can then be directed to the higher centres. The two-headed drum produces deep tones and is widely used for shamanic purposes. 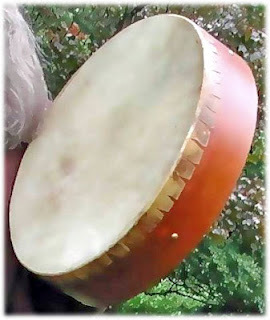 The single-headed drum, besides being a traditional instrument used by Irish and Scottish musicians, is prevalent among Eskimo or Siberian shamans, and among shamans from Native American peoples such as Lakota, Blackfeet and Northwest or Alaskan tribes. Here the upper half of the drumhead usually represents the Higher World, while the lower half identifies the Lower World. These two sides are often painted differently or have indicators that allow the shaman to understand which is which. Also be aware that categorisations and physical identifications in shamanic drums are not at all rigid as it is always the Intent of the shaman that shapes the reality. Therefore, no matter on which side or half of the drum I beat, if I focus my consciousness on the Higher World, that is the area that is going to be activated. There are different types of shamanic drums. Traditional frame drums are circular or oval, and are held in the left hand, leaving the other hand free to beat the drum, generally with a stick that some shamans call a whip. Rawhide drums produce a much more articulate and powerful sound, yet they do not have a fixed pitch and are very sensitive to variations in temperature or weather conditions. Their energy varies according to the type of leather or wood: goat, deer, horse and shark have different energies, as do oak and maple. Although diverse in terms of energy, both rawhide and synthetic drums are equally effective for shamanic work. Different types of sounds are produced according to the area of the drum that is played and the inclination of the drumstick. Usually, the central part generates a deep sound, whereas as you proceed closer to the edge, the tone becomes more and more acute or bell-like. I prefer to hold the stick gently and allow gravity to prevail rather than imposing my control. The sound of the drum can generate frequencies in the theta wave range (four to seven cycles per second), which induce a deep trance state or perception of non-ordinary realities, as well as in the alpha wave range (seven to thirteen cycle per second). The latter is the primary frequency engendered by Earth’s electromagnetic field and generally produces light trance and ideal conditions for shamanic experiences. This feature makes the drum a precious companion in shamanic journeys, healing work and rituals. Some shamans also employ the drum for divinatory purposes. For example, they toss the drumstick and take decisions according to the position it lands. Please be aware that drums, rattles or any other instrument are not essential in shamanic work. This means that it is important to purchase or use them only if there is a sincere attraction and connection. The journey to find a drum is a sacred path. It does not matter if it takes time to get one. Holding the tension of not having one yet, often adds to the power and excitement of surrendering to the right moment in which a drum, if this is the case, will become available for me. As with all Sacred Tools, once you have purchased or received it, you can activate it through a ceremony of your choice and regularly take care of it. For example, you can offer smoke to your drum before and after every shamanic journey or ritual, and wrap it in a nice cloth when it is not in use. Before starting to beat the drum, unless it has a synthetic head, check if the drum is flat. If this is the case, you can dry it out by gently exposing it to a source of heat (a candle, fireplace, etc. ), putting your hand in between to test the temperature. If the drum is too dry, you can spray it with water and then spread the water all over the head with one hand. At the start of a drumming session it is often a good custom to smudge yourself, the participants, the drum and the environment. Suitable herbs for this purpose are sage, sweetgrass, cedar, lavender or tobacco. Then it is also advisable to call the Directions, offering smoke or invocations, and to officially open the Sacred Circle. The aim is to ground yourself and make sure that your body is anchored in the physical reality. This also involves sitting in a comfortable and empowering position. Keep your spine straight and breathe deeply using the full capacity of your lungs. Bring your attention to your breath and allow it to move to all parts of the body. Then let it extend to the drum and the stick that you are holding. Become one with the drum and its stick. Allow tensions to be released and find the right posture for you. Before drumming, I tend to remain silent for some time and connect with the Intent and Function. I listen to the beat of my heart and attune it to the drum. Once I have formulated my Intent and aligned it to the frequency of my heart, I invite the drum to carry its pulse as I start beating. As I proceed with my drumming I can allow the tempo to expand and change. At a certain stage I can also add my voice. Each Sector and each Totem Spirit has its own rhythm and chant. Some of them belong to specific traditions, others are spontaneously produced when they are played. The end of a drumming session is usually announced by a series of fast or slow beats. I generally conclude the drumming session by giving thanks for what has been received and closing the Sacred Circle. 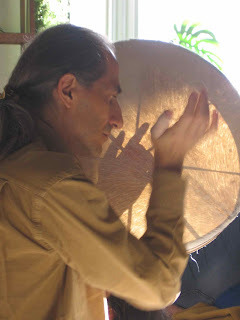 Mediterranean shamanic drums are generally played with bare hands. For this purpose drumming tapes or CD are also effective. For further information, please connect with your Mentor. For a list of books on drums and drumming click here.